The sun was trying so hard to come out this morning but wasn't succeeding. Still, it was great to see such brightness. This was taken with natural light in front of a window. 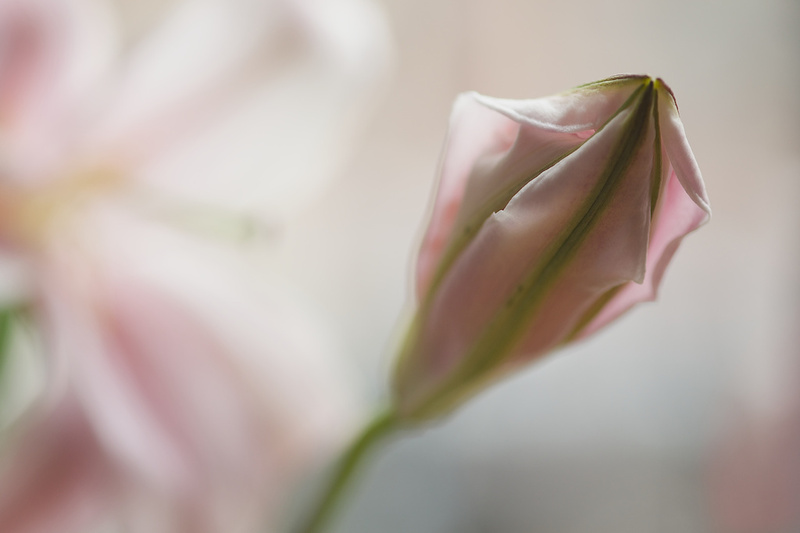 I wanted to capture the lily just as it was about to bloom, with the hint of a mature flower in the background. Taken with my 105mm macro. Incredibly soft and beautiful! Love the focus and that baby pink! Fav! Love the lovely pink/green combo. Pretty composition! The image of what it will become faded in the background is wonderful. Love the focus and the light! so soft and pretty! lovely soft focus, very pretty! Lovely. What everyone else said. Fav! Lovely Lilly! Gorgeous background. Fav! I hope I can emulate this later this month when my potted tulips start to bloom! What a great focus and shot! So delicate and soft - just love it! Beautiful macro. Love Lillie's. Lovely soft colour. Beautiful macro! Love the soft colours and tones! Perfect focus and dof! Fav! A beautiful simple shot, so delicate and pretty. so delicate and pretty! love the shallow dof and pastel tones! A very beautiful capture, love this shot so pretty. Fav! Needs to be seen enlarged - simply gorgeous! The delicate color and symmetry of the bud is really attractive. Lovely capture. Such soft, delicate color. Wonderful softness and tones. Fav! Beautiful pastel tones,a lovely shot!! Lovely...perfect focus and softness. first thing that came to my mind was that this shot gives a sense of hope. I can really see it as background for some inspirational quote. A fav! Very very beautiful, so soft and love the pastel colors, Fav! @filsie65 Great idea! I actually ran a technique challenge with forced perspective but couldn't enter it, of course. So that will be a lot of fun and with our unpredictable weather, will work indoors or out. Thanks! @darsphotos Darlene, thanks so much for your views and fav today!! I really appreciate your support! The color, the focus, the contrast between the bud and the out of focus open flower, such a perfect spring shot for the middle of winter....beautiful! wow that is so pretty, so soft and delicate! Lovely color and tones! Great shot! So soft and delicate. Fav! Beautiful dof and pastel muted tones. gorgeous DOF this shot has a beautiful softness to it.